In brief: Arthur Arutkin has taken out the “Double Downwinder” event at the Grand Prix Guyader regatta in France over the weekend. Arthur made it a clean sweep of a very competitive field, winning both Saturday’s and Sunday’s downwinders to continue his solid early season form. 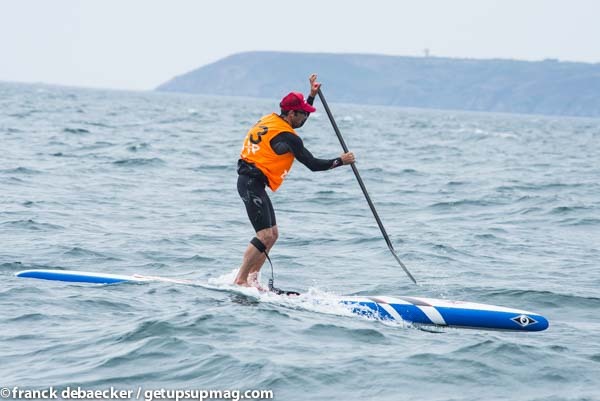 A rejuvenated Eric Terrien, the former king of European paddling, turned back the clock to take the runner-up spot, finishing third Saturday and going one better the next day. Eric was in a close battle the whole time with rising junior prospect Martin Letourneur, who finished just 17 seconds adrift on the final standings after almost three hours of ocean paddling. Arthur won day one in a time of 1:12:44, about 40 seconds ahead of Martin and Eric. Day two saw a different, longer course, which Arthur conquered in 1:31:42 to give him a combined total of about 2 hours 45 minutes for the weekend (finishing times from each day were combined to produce the overall event standings). However the young gun didn’t have it all his own way, particularly on day two where Eric put in a vintage performance that fell just nine seconds short after 90 minutes of paddling, while Martin was a further 25 seconds adrift. Also impressive was fourth-placed Romuald Mamadou, who hails from the French Caribbean outpost of Guadeloupe. Veteran of the French paddling scene, Greg Closier, and dark horse Martin Vitry weren’t far off the pace either. Amandine Chazot triumphed in the smaller women’s field, combining two good runs for an overall time of 3:11:19. The Double Downwinder was invented at the Gorge Paddle Challenge a couple of years ago and seems like a great format that helps keep multi-race events interesting. While the Grand Prix Guyader wasn’t strictly billed as a “Double Downwinder,” that’s my interpretation of it, so let’s stick with the name. It’s kinda catchy, after all. 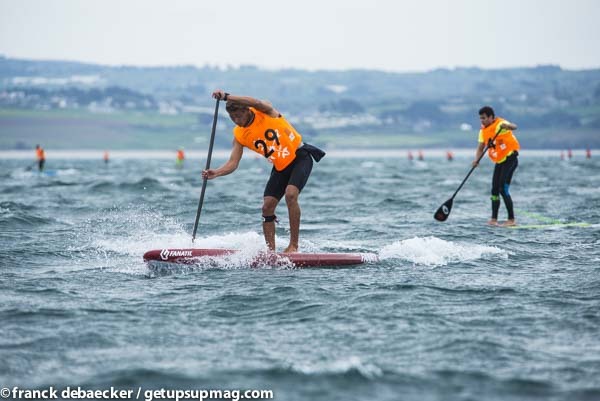 The excellent Get Up SUP Mag was on the scene and has a full writeup, which you can read via this dodgy Google translation. The Grand Prix Guyader was also part of the French Cup (the 14′ version, that is; France has separate national series for both 12’6 and 14 boards…).